ICJ2018 was successfully closed. Thank you for your cooperation. The Proceeding PDF is still open. 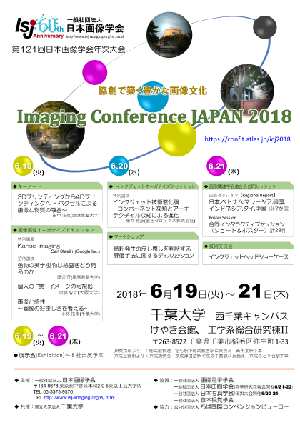 “Imaging Conference JAPAN 2018”, the 121st Annual Conference of the Imaging Society of Japan will be held with the following agenda. The “Imaging Society of Japan” provides opportunities to discuss the leading-edge imaging science and technology including hardcopy, and various marking technologies, novel imaging technologies such as electronic paper and other electronic imaging system, as well as digital fabrication technologies to contribute to progress in all the related fields. This annual conference is the valuable opportunity to make active discussion and exchange of ideas concerning the latest investigations for members. We look forward to your submission and seeing you at the conference. In 2018, the Japanese Society of Printing Science and Technology, the Society of Photography and Imaging of Japan and the Imaging Society of Japan jointly hold annual meetings during June 19 to 22. The International session and the interactive session are managed as joint sessions. We hope further improvement and “Co-innovation” through the discussion with participants from wider region of countries and technologies. 画像感性特別講演 Carl Staelin氏のプレゼンテーション資料のURLを頂きました。リンクはバナーからお入りください。　／ Dr. Carl Staelin released the presentation file of "Kansei Imaging" on the web. Click the banner. 6月21日に行われたポスターセッションで、日本画像学会誌編集委員長賞に大阪府立大学 饗庭智也さん「溶液プロセスによる短チャネル有機トランジスタの高移動度化: MoO3塗布注入層を用いた接触抵抗低減」が選出されました　／　Mr. Tomoya Aiba (Osaka Prefecture Univ.) won the ISJ Journal Chief Editor's Award 2018. 予稿PDFを公開しました。パスワードは会場でご確認ください。／　Proceeding PDF is now open. Password is announced at the conference site. 展示会の出展社リストを掲載しました。「展示会」のページをご覧ください。／ Exhibitor's list is uploaded. See [Exhibition] page. Copyright on Imaging Conference JAPAN 2018 site, you agree not to redistribute The Imaging Society of Japan.